Politics • Herbert draws second rival in battle for Republican nomination. Tribune File Photo Gov. Gary Herbert on Thursday signed a controversial congressional redistricting map, saying it is reasonable. Democrats have vowed to sue, saying it is a product of partisan gerrymandering intended to ensure all four U.S. House members from Utah are Republican. CHRIS DETRICK | Tribune file photo Morgan Philpot, pictured on Election Night 2010, when he narrowly lost to Rep. Jim Matheson, the state's only Democrat in Congress. He now will run for governor. Scott Sommerdorf l Tribune file photo Rep. Kenneth Sumsion, R-American Fork, was the first to announce he would challenge Gov. Gary Herbert for the Republican nomination. Tribune file photo Gov. Gary Herbert now faces two challengers within the GOP in next year's election. Chris Detrick | Tribune file photo Morgan Philpot will run for the Republican nomination for governor against Gov. Gary Herbert and state Rep. Ken Sumsion. He is paictured here on election night of 2010, when he narrowly lost to Rep. Jim Matheson, D-Utah. Former state lawmaker and Republican congressional nominee Morgan Philpot said Wednesday he plans to take on Gov. Gary Herbert, becoming the second GOP challenger in the race. Philpot has scheduled a news conference Thursday morning to make his announcement official, but confirmed to The Salt Lake Tribune that he would be announcing a bid for governor. 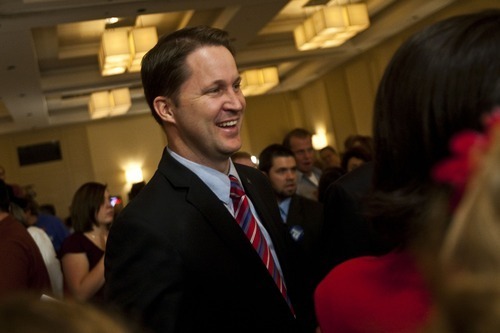 Philpot, 40, challenged Rep. Jim Matheson in 2010, finishing within five percentage points of the Democratic incumbent, and he had been openly considering another bid for Congress. But in recent weeks he began moving toward the governor's race. "That was a very hard decision and no mater how hard [my wife] Natalie and I tried to make that race work it never ended up feeling right or our family  the move, the boundaries," Philpot said. "I typically run where I'm needed and I think there's a lot of great candidates getting into that [2nd District] race." Philpot said that, after watching Congress' inability to balance the budget and the failure of the Supercommittee he was struck at "how broken D.C. is." "No matter what happens they will not change things," he said. "I could spend two years, I could spend 20 years and probably make very little difference and then to realize that there are no freshman governors. I could get into this race and in four years change the Western political landscape ... taking the fight to D.C. from the state side through good state policy." And Philpot said if Matheson decides to run for governor  an option the Democratic congressman has said he is considering  then "I'm needed in that race." "I think Republicans need to put their best campaigner forward," Philpot said. "I think I'm one of the only people who can beat [Matheson]." Ben Horsley, a spokesman for Herbert's campaign, said the governor is "providing exactly the kind of leadership that is critical to Utah's steady economic recovery and private sector jobs expansion." Horsley said the governor has balanced the budget without raising taxes and fostered a favorable business environment that has spurred economic growth. He said Herbert is confident voters will support the governor's vision. 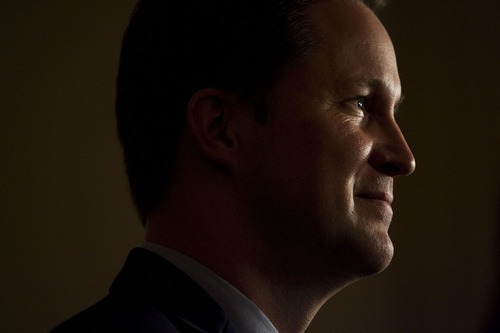 During redistricting, Philpot blasted Herbert, accusing the governor was gaming the congressional boundaries to try to avoid a face-off with Matheson. That prompted Dewey Reagan, president of the billboard company Reagan Outdoor Advertising, where Philpot works as an attorney, to write a letter to the governor apologizing for Philpot's actions and assuring the Herbert he continued to have Reagan's support. "I've loved the Reagans and I've loved working for them. I will be leaving that job at the end of [December] to protect them. They shouldn't have to suffer any consequences for my decision," Philpot said. "In a state where government functions as it should, no harm would ever come to a company [for an employee's actions], nor should it." Reagan Outdoor gave $10,000 to Herbert's re-election campaign during the governor's recent gala, which saw Herbert rake in about $1 million for his bid. He has raised about $1.3 million since June. "They rely on money and I don't," Philpot said of the fundraising disadvantage. "I love Governor Herbert. I consider him a friend. I respect him and I know it sounds odd to run against someone you respect. But he's going to need at least 10 times what I have." Quin Monson, associate director of the Center for the Study of Elections and Democracy at Brigham Young University, said Herbert has managed to avoid serious challenges in the past. The fact he has two challengers this time might indicate a perception the governor is vulnerable  and was perhaps more so in the aftermath of a legislative session that saw a bitter immigration feud and fallout from unpopular revisions to the state open-records law  "but I don't see that he's actually in a particularly weak position." 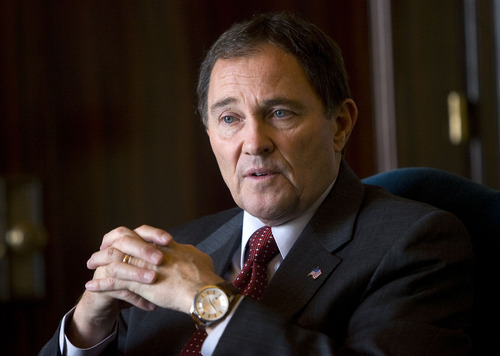 Herbert had a 71 percent approval rating in a statewide survey conducted in September by Monson and his colleagues. 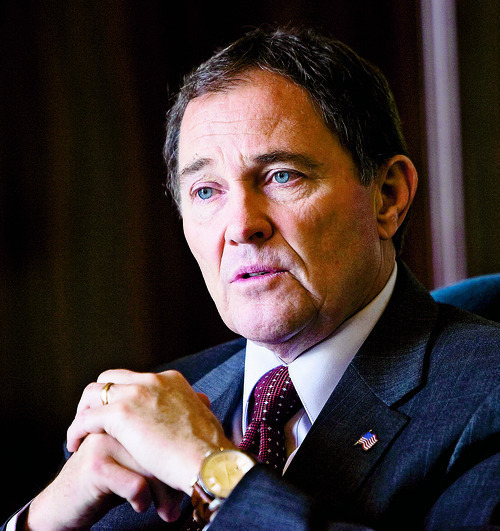 Among those self-identifying as strong Republicans, Herbert enjoyed a 92 percent approval rating. "I don't see any evidence of strong grass-roots dissatisfaction" with the governor, Monson said. "I think he's got the upper hand." Philpot joins state Rep. Ken Sumsion, R-American Fork, in challenging Herbert for the Republican nomination. No Democrat has yet jumped into the race. Matheson is seen as the party's best shot, although Sen. Karen Morgan, D-Cottonwood Heights, has also expressed interest in running. 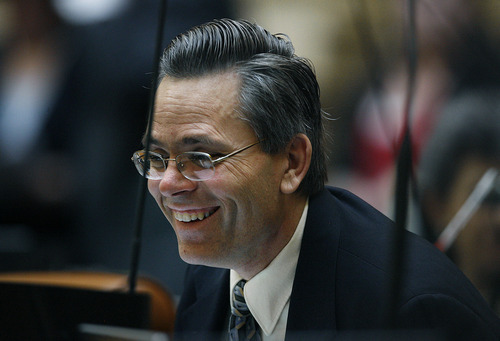 Utah Republican Party Chairman Thomas Wright said intra-party fights can be messy, but he doesn't anticipate a bloody gubernatorial fight. "I think with the candidates we have in the race we have a lot of experience and discernment and I think the candidates ultimately know we want a Republican in the governor's mansion," he said. "They'll run respectable races against each other and will produce a great candidate."